*Corresponding author: Hussnain Mirza, Center for Neonatal Care, Florida Hospital for Children, Orlando, USA. Preterm infants are at risk for Intraventricular Hemorrhage (IVH). Severe IVH (grade 3 or 4) is associated with high mortality, periventricular leukomalacia, post hemorrhagic ventricular dilatation and severe neuro disability. To the best of our knowledge, spontaneous and complete resolution of grade 4 IVH has never been reported. To screen for IVH, head ultrasound is the most common modality. Severe IVH can be well differentiated from other etiologies especially if serial ultrasounds are performed. We are reporting a preterm infant with severe IUGR born at 28 weeks gestation. Usually if the birth weight is less than 400 grams, neonatologist do not recommend neonatal resuscitation due to smaller tracheal size and difficulty in securing endotracheal tube. As this infant was born at 28 weeks, neonatology team has attended the delivery. Endotracheal intubation was successful despite an incredibly low birth weight (288 grams only). We assume that tracheal size is not exclusively associated with birth weight, gestational age is an important variable that shall be considered to make a delivery plan for infants with estimated birth weight <400 grams. This infant also developed grade 4 IVH on day 1 of life. However, this extensive IVH was completely resolved without any significant morbidity. Infant had a normal neurosonogram by 3 months of life. Post hemorrhagic residual white matter injury was evident only on the CT scan and MRI of brain. We propose that MRI of brain should be considered at term equivalent gestation in extremely premature infants with IVH especially if subsequent head ultrasound appears normal. Neonatal resuscitation is generally not recommended for preterm infants weighing <400 grams at birth . This threshold is more appropriate for infants born at margin of viability (22-23 weeks gestation). Most clinical outcome studies report data for infants with birth weight 401 grams or higher . However, some infants with disproportionately advanced gestational age may be <400 grams at birth due to the intra uterine growth retardation (IUGR). Szpinda et al. have reported fetal tracheal size correlates better with the gestational age rather than the fetal weight. Therefore, gestational age of an infant shall be considered in planning to provide life support for infants with estimated fetal weight <400 grams. Intraventricular hemorrhage (IVH) is a significant complication of prematurity. IVH risk is highest for infants born near the margins of viability [4,5]. Sever IVH is associated with a high risk for brain injury . Parental counseling is based upon historical data for severe IVH outcomes including high risk for mortality (up to 60%), cerebral palsy or some other neurodisability (up to 80% of the survivors) [5,7]. 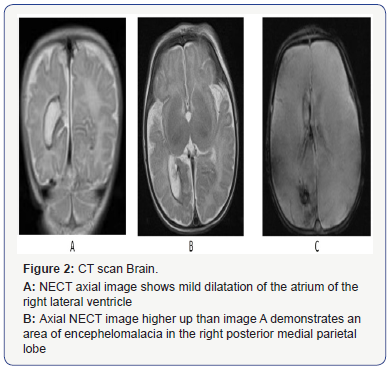 Infants with severe IVH may develop periventricular leukomalacia (PVL), progressive post hemorrhagic ventricular dilatation or hydrocephalus requiring neurosurgical intervention . Due to the poor prognosis and the risk for major neurodevelopment disability secondary to severe IVH, many clinicians offer redirection of care and withdrawal of life support. To the best of our knowledge, spontaneous and complete resolution of grade 4 IVH without any significant PVL or PHVD has not been reported so far. We are presenting a preterm infant born at 28 weeks gestation weighing only 288 grams who developed grade 4 IVH that was completely resolved without any residual morbidity. Baby boy “J” was born at 28weeks gestation. Mother was 25 years old, Caucasian, gravida 3, para 0. Maternal blood type was O positive, antibody screen negative. She was rubella immune and all her prenatal labs were negative. There was no history of maternal herpes, skin rash or febrile illness during the pregnancy. Mother had no known medical illness. However, she was carrier for cystic fibrosis but father had no known genetic disease or carrier state. There was no history of maternal smoking or hypertension. Severe fetal growth restriction was noted on serial prenatal ultrasounds along with oligohydramnios since the 18th week of gestation. No rupture of membrane or loss of amniotic fluid was noted. Amniocentesis was declined and etiology for severe IUGR remained unknown. Mother presented in preterm labor at 28 weeks gestation. Placental Doppler showed absent end diastolic flow, anhydramnios, and estimated fetal weight was only 280 grams. Two doses of antenatal steroids were administered and infant was delivered by C section. Apgar scores were 1, 2 and 7 at 1, 5 and 10 minutes respectively. Endotracheal intubation was successful with a size 2.0 endotracheal tube. Infant was transferred to neonatal ICU for further management. Head ultrasound on the day of delivery showed an abnormal hyperechoic area consistent with grade 4 IVH in the right parietaloccipital and temporal regions. Next day, the opacity appeared significantly increased in size, local mass effect on the right lateral ventricle and brainstem was noted along with 2-3 mm subfalcine herniation. Left cerebral edema was also noted. Infant required blood transfusion due to the sudden drop of hematocrit from 45% to 28%. By day 3, there was an extensive echogenic lesion throughout the right cerebral hemisphere (both intra and extraaxial). Mild ventriculomegaly was noted on repeated head ultrasounds over the next week. Ventricle size stabilized by 2 weeks of life. Head ultrasound at 3 weeks of life was stable and the intracerebral echogenic lesion started to resolve and only slight lateral ventricular asymmetry was noted by 4 weeks. By 3 months of age, the intra-parenchymal echogenic lesion was completely resolved with no ventriculomegaly or any residual PVL. Cranial ultrasound images from day 3 and 3 months of life are shown in the Figure 1. Infant’s head circumference followed the 3rd percentile and no other clinical signs/symptoms of increased intracranial pressure were noted during the course of hospitalization. Infant was noted to have recurrent apnea and clinical seizures at 3 months of life that required treatment with phenobarbital. EEG was remarkable for multifocal seizure activity. To follow the unusual sonographic resolution of grade 4 IVH, non-enhanced computerized tomography (NECT) of the brain was performed at 46 weeks of corrected gestation. There was hypo attenuation involving the deep white matter of the right occipital lobe immediately adjacent to the trigone of the right lateral ventricle extending to the medial parietal cortex. Most likely this encephelomalacia and ex vacuo dilatation of the trigone of the right lateral ventricle were related to prior grade 4 hemorrhage. No acute ischemia, hemorrhage or mass effect was identified. CT images are shown in the Figure 2. MRIbrain was performed at 47 weeks of corrected gestation. Ependymal surface of the ventricles appeared abnormal. 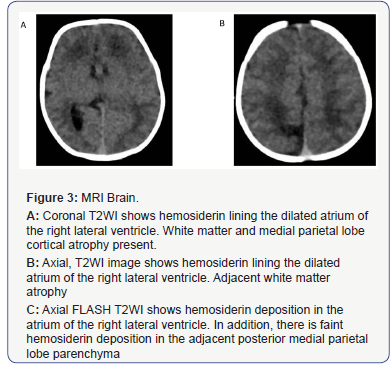 Hemosiderin staining on T2WI and GRE sequences was reported at the level of trigone/ posterior margin of the right atrium that correlated with the IVH noted on the initial head ultrasound. Developing encephelomalacia and gliosis at the right occipital/parietal lobe junction was also noted. These findings were consistent with developing subacute stigmata of focal periventricular leukomalacia (PVL). MRI images are shown in Figure 3. This extremely premature infant with severe IUGR of unknown etiology was delivered at 28 weeks gestation. Although estimated fetal weight was <400 grams, neonatology team decided to attend the delivery because of the gestational age. Endotracheal tube (size 2.0) was secured in first attempt indicating an adequate airway size to provide life support. It is suggested to withhold resuscitation of preterm infants weighing <400 grams at birth . This recommendation is based upon assumption that endotracheal intubation will be difficult for infants weighing <400 grams due to the smaller airway size. However, tracheal size is a linear function of gestational age . Decision to provide life support shall not be exclusively based upon an estimated fetal weight without considering the gestational age of the infant. This infant was also diagnosed with grade 4 IVH based on the cranial ultrasound findings on day 1 of life, which progressed over the next 3 days. These abnormal sonographic findings completely resolved by 3 months of age. To the best of our knowledge, complete resolution of sonographic findings of grade 4 IVH has never been reported. 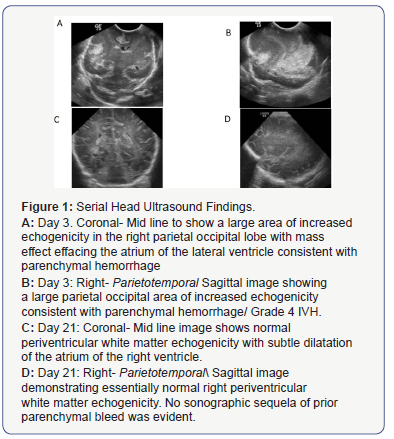 As the diagnosis of grade 4 IVH is based upon the increased echogenicity visible in the head ultrasound images, we reviewed the differential diagnosis for increased echogenicity on cranial ultrasound for this infant. Increased echogenicity on neurosonograms can be seen due to hemorrhage, brain edema, early leukomalacia due to hypoxia or placental insufficiency and intracranial tumors like choroid plexus papilloma or ependymoma [9-11]. Congenital infections (TORCH) usually cause intracerebral calcifications but rarely cystic encephelomalacia may be seen . Increased echogenicity due to brain edema is usually diffuse. Focal ischemic changes due to hypoxia or placental insufficiency may result in periventricular echogenicity that will later develop cystic leukomalacia. However, these changes do not involve large cerebral areas causing subfalcine herniation. Increased echogenicity secondary to the intracranial tumors is well circumscribed and does not spontaneously resolve. While the sonographic abnormality resolved in this infant, both CT scan and MRI of the brain showed residual effects of previous intraparenchymal hemorrhage. Infant was discharged home at 6 months of life with low flow nasal cannula. At the time of discharge, infant appeared appropriately responsive and interactive. Neurological examination was essentially normal. Similar clinical outcomes for grade 4 IVH were reported by Mahta et al if infants do not develop post hemorrhagic hydrocephalus . As the fetal tracheal size is a function of gestational age, neonatal resuscitation shall not be discouraged for preterm infants with severe IUGR based on birth weight <400 grams. Although extremely rare, spontaneous resolution of grade 4 IVH is possible. For infants with severe IVH, MRI brain should be performed at term equivalent postmenstrual age especially if the neurosonograms at 36 weeks post menstrual age shows complete resolution of IVH. Kattwinkel J, Perlman JM, Aziz K, Colby C, Fairchild K, et al. (2010) Neonatal resuscitation: 2010 American Heart Association Guidelines for Cardiopulmonary Resuscitation and Emergency Cardiovascular Care. Pediatrics 126(5): e1400-1413. Stoll BJ, Hansen NI, Bell EF, Shankaran S, Laptook AR, et al. (2010) Neonatal outcomes of extremely preterm infants from the NICHD Neonatal Research Network. Pediatrics 126(3): 443-456. Szpinda M, Daroszewski M, Wozniak A, Szpinda A, Mila-Kierzenkowska C (2012) Tracheal dimensions in human fetuses: an anatomical, digital and statistical study. Surg Radiol Anat 34(4): 317-23. Radic JA, Vincer M, McNeely PD (2015) Temporal trends of intraventricular hemorrhage of prematurity in Nova Scotia from 1993 to 2012. J Neurosurg Pediatr 15(6): 573-579. Volpe JJ (2001) Neurology of the newborn. In: (4 edn. ), WB Saunders, London. Song J, Xu F, Wang L, Gao L, Guo J, et al. (2015) Early amplitudeintegrated electroencephalography predicts brain injury and neurological outcome in very preterm infants. Sci Rep 5: 13810. Tsai AJ, Lasky RE, John SD, Evans PW, Kennedy KA (2014) Predictors of neurodevelopmental outcomes in preterm infants with intraparenchymal hemorrhage. J Perinatol 34(5): 399-404. Brouwer MJ, van Kooij BJ, van Haastert IC, Koopman-Esseboom C, Groenendaal F, et al. (2014) Sequential cranial ultrasound and cerebellar diffusion weighted imaging contribute to the early prognosis of neurodevelopmental outcome in preterm infants. PLoS One 9(10): e109556. Slovis TL, Shkolnik A, Haller JO (1989) Focal areas of increased echogenicity within the brain. J Ultrasound Med 8(1): 31-37. Bhat V, Bhat V (2014) Neonatal neurosonography: A pictorial essay. Indian J Radiol Imaging 24(4): 389-400. Rosier-van Dunne FM, van Wezel-Meijler G, Kaschula RO, Kaschula RO, Wranz PA, et al. (2011) Placental histology related to fetal brain sonography. Arch Dis Child Fetal Neonatal Ed 96(1): F53-58. Grant EG, Williams AL, Schellinger D, Slovis TL (1985) Intracranial calcification in the infant and neonate: evaluation by sonography and CT. Radiology 157(1): 63-68. Mahta A, Katz PM, Kamel H (2016) Intracerebral hemorrhage with intraventricular extension and no hydrocephalus may not increase mortality or severe disability. J Clin Neurosci 30: 56-59.